21 January, DAVOS—Robert Swan spent more than five years planning the South Pole Energy Challenge Expedition (SPEC). 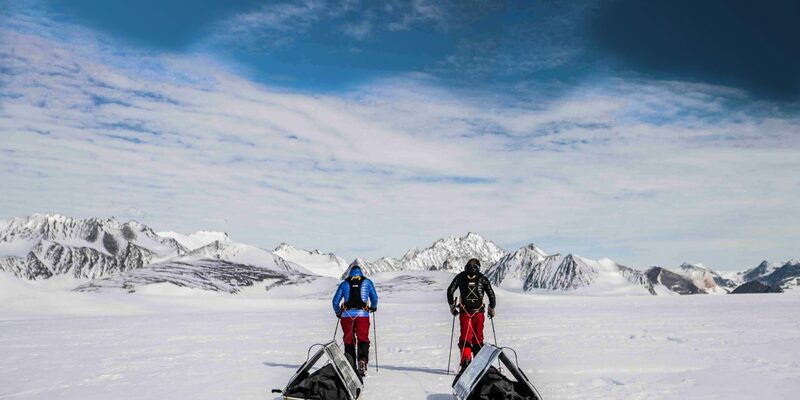 He and a small team would ski 600 miles to the Geographic South Pole using only renewable energy. Their thesis: If it could be achieved in the highest, driest and windiest place on Earth, there is potential to utilize renewable energy anywhere in the world. Swan describes the journey in an exclusive interview with Global GoalsCast (“Journey Across Antarctica: the Swans and Climate Change”), a new podcast that profiles bold individuals’ efforts toward achieving the 17 UN Sustainable Development Goals by the year 2030. Swan and his son and fellow explorer, Barney, will speak live with Global Goalscast co-hosts Claudia Romo Edelman and Edie Lush on January 25 at the World Economic Forum. Robert, 61 and the first man ever to walk to both the North and South Poles Swan, said he couldn’t keep up. While he didn’t have health or equipment issues and could ski an impressive 10 nautical miles each day, he couldn’t sustain the 12 to 14nm required to reach the South Pole and test all the technology before the Antarctic winter began. Robert reports to the Global GoalsCast that the he encountered an unprecedented “pie crust-like” ice texture in Antarctica that made it more difficult to traverse than in past expeditions. Swan acknowledges that while there is no official scientific conclusion proving the cause of the altered ice conditions, the change could be presumably related to climate change. “The surfaces across which we were travelling were surfaces none of us have ever experienced before. Not just me, five of the top polar travelers in the world who are making journeys in Antarctica have all commented on the fact that the surfaces this year in Antarctica are different than they’ve ever been before…We believe – all of us – that it is a sign that we are changing even in the coldest parts of Antarctica,” Robert said. The eight-week Antarctic expedition aimed to highlight to younger generations that there is no silver bullet to the challenge of climate change. It is up to all players in society – including including governments, industry, entrepreneurs and corporations – to work together to develop cleaner energy solutions. “Our effort, yes, is extreme, but it gives us is a story that underlines and hopefully inspires people to make change because we cannot carry on as we are. The way that we are living is not sustainable. If we can survive here [in Antarctica] on renewable energy than we can do that anywhere on the planet – and that is the message,” Robert said. Robert ultimately rejoined the team at the 89th parallel and completed the last 60 miles to the Geographic South Pole. As the official sound of Global GoalsCast, HARMAN provides financial support as well as AKG microphones, and JBL and Harman Kardon headphones to help capture and communicate dramatic stories that will educate and engage listeners around the world. Global GoalsCast also counts on the support of NRG Energy Inc. Finally, none of this would have been possible without the support of our main patron, Richard Edelman, who has been the angel behind Global GoalsCast and Rob & Barney Swan. Don’t miss the first account of the Swan’s perilous journey across Antarctica in a premiere episode of Global GoalsCast, available on Apple Podcasts and other podcast platforms. HARMAN (harman.com), a wholly-owned subsidiary of Samsung Electronics Co., Ltd, designs and engineers connected products and solutions for automakers, consumers, and enterprises worldwide, including connected car systems, audio and visual products, enterprise automation solutions; and services supporting the Internet of Things. With leading brands including AKG®, Harman Kardon®, Infinity®, JBL®, Lexicon®, Mark Levinson® and Revel®, HARMAN is admired by audiophiles, musicians and the entertainment venues where they perform around the world. More than 50 million automobiles on the road today are equipped with HARMAN audio and connected car systems. Our software services power billions of mobile devices and systems that are connected, integrated and secure across all platforms, from work and home to car and mobile. HARMAN has a workforce of approximately 30,000 people across the Americas, Europe, and Asia.